Windows Timeline and the cloud-powered Clipboard, two features that were announced and shown off at Build 2017 earlier this year, will not be making the Fall Creators Update as expected. Microsoft executive Joe Belfiore tweeted about the new timing for Timeline in response to a comment from The Verge's Tom Warren. According to him, they’re planning for the feature to be in early insider builds shortly after Fall Creators Update is out, with the next major update for Windows 10 expected to land sometime around March 2018. 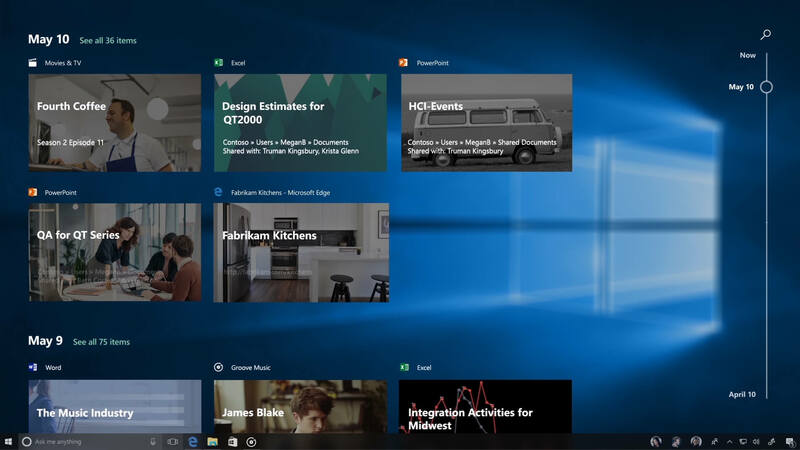 Timeline is described as an extension of Windows 10's current Task View. The feature utilizes a visual “timeline” to let you “jump back” in time to a previous activity; think of it as a time machine for resuming work on earlier sessions. This will work in conjunction with another new feature that lets you “pick up where you left off” working across multiple devices, much like Apple's continuity and handoff features in iOS and macOS but cross platform, with support for Android and iOS devices. In addition, the new cloud-based “virtual” clipboard, which will make it easy to copy and paste content spanning various platforms, is also now expected to arrive next year. Belfiore says that the features haven’t been delayed, they’re just not ready for this update and that they tried to convey that timing wasn't specific on these features while showing them off at Build.